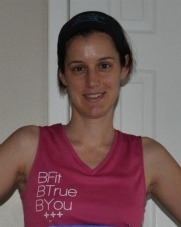 My name is Toni and I blog over at Running, Loving, Living. I am married with 2 beautiful daughters, 14 and 2. I am also a homecare RN working weekends and holidays. I love to run, weight train, cook healthy and blog. I hope to be able to inspire and motivate others to get healthy and live life to the fullest. Run often, Love completely, Live fully. There are so many fitness systems on the market it is hard to know which one to choose, but the answer is always the one that you are going to follow through with and use as instructed. I have tried many different workout systems including P90X and have failed miserably at staying committed until I found Supreme 90 Day. Supreme 90 Day is a complete workout system that includes all the workouts and a diet plan that you will need to follow this program for 90 days. The system includes 10 DVD’s (Chest&Back, Legs, Ultimate Ball, Tabata Inferno, Cardio Challenge, Shoulders&Arms, Total Body, Back&Bi’s, Chest Shoulders&Arms and Core Dynamics) that work your entire body utilizing muscle confusion to keep your body guessing so you continue to see results throughout the whole program. The only equipment you need is a mat, a stability ball and dumbbells. The Diet plan is written by Clean Eating’s Tosca Reno and it has 30 days worth of meal plans with recipes that you repeat twice during the program. I am about halfway through the program and I absolutely love it and I will tell you why. These workouts are tough. Each DVD lasts between 30 and 45 minutes which is the perfect amount of time for a workout and by the time I am finished I am dripping sweat. I have quickly seen results in my strength as I have needed to increase the weights that I use from 5 lbs to 8 lbs to 10 lbs in a short period of time. I have also lost inches, weight and have seen visible changes in my body after just 30 days which has provided me with the motivation to continue the program for the full 90 days. As with every program there are always pros and cons. Intensity: These workouts are intense and burn a ton of calories. Muscle Confusion: Your body is always guessing which means you continue to see results throughout the whole program. Time: Each workout is 30-45 minutes rather than an hour or more, like with P90X, which is way too long in my opinion. Results: Seeing results keeps you motivated to continue the workouts. Price: Only $19.95 vs. hundreds you can spend on other programs. Portability: You need a stability ball and dumbbells which can be difficult to travel with. Although there are modifications for some of the workouts if you don’t have a stability ball, there are no substitutions for dumbbells. If you travel often this may not be the workout for you. Medical problems: Due to the high intensity of these workouts with both your own body weight and added weight with the dumbbells, if you have joint issues or back issues this may not be the workout for you. You should always check with your doctor prior to starting any kind of workout program. Restrictive diet: The diet provided is great but it requires you to eat 5-6 times a day and it is pretty restrictive which can be difficult for some people to follow. However, you can not expect to have extreme results if you are not eating healthy. Even if you do not follow their diet you need to eat clean. Overall, the Supreme 90 Day System is a great system for anyone looking to change their body. It does not require a lot of space to do the workouts, just a small area is fine. Supreme 90 Day also offers support through their website forums, on Facebook and through Twitter so you are never completely on your own. I have another 45 days left on this program and I plan to see it through to the end and then continue to include the Supreme 90 Day workouts in my fitness regimen.